Although it's the grown-ups who take out the rubbish and buy the new clothes, it's our children who will be left with the legacy of how we approach those tasks. So when central character Erin, in Modest Predicament's charming new show, teaches the grown-ups in her village about repairing and recycling, we all know it's really us she's talking to. 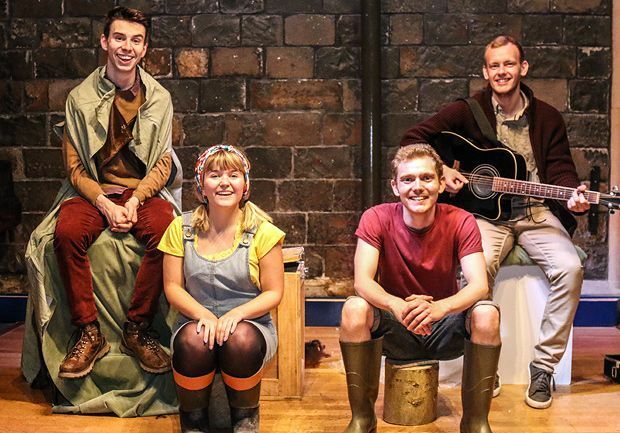 That this young Glasgow company can deal with a topic often viewed as 'worthy', without coming across as preaching or patronising, is a credit to their theatrical skills. Four talented performers deliver this most crucial of messages in such a funny, clever way, it's impossible to ignore. When Erin's twin brother goes missing, she sets out on a quest to find him in the countryside. There she discovers the toll we humans are taking on the planet, courtesy of some incredibly cute recycling creatures and a mountain giant, so heads back to her community to tell them all about it. Live guitar, harmonious singing and a witty script all keep both adults and children hooked throughout, and – you would like to think – sends us all home looking for the small changes we can make in our own lives. Scottish Storytelling Centre, until 21 Aug (not 17–19), 11.30am, £7 (£6). Storytelling, puppetry and music combine for this lesson on environmental topics for ages 5+.